On Wednesday this week I finally met with my neurosurgeon to get the results of my 3-month follow up MRI scan. As usual he uploaded the 3D images of my brain on the monitor and began to talk through the results. My surgeon is not solely responsible for my treatment. He is part of a Multi Disciplinary Team (MDT) which includes different kinds of doctors, nurses and other healthcare professionals working together as part of a specialist cancer team. Overall, I would say this news is neither negative or positive. Yes, there is a small relief that all going well I won’t need any treatment for the next 5 months. But, beyond that who knows? I am effectively stuck in limbo. When I was diagnosed with cervical cancer 5 years ago the life I knew pretty much vanished overnight. After ploughing through treatment I had to come to terms with a ‘new normal’ – one which included infertility, menopause, fatigue and a total loss of confidence. Once again I am faced with the challenge of adapting to another new normal. There is not one part of my life that cancer does not impact. I can’t put into words how much it has stolen from me and I feel duty-bound to share how this really feels. Happy FUCANCER Friday and apologies for the long pause since my last update. I would love to report that I have been sailing the Carribean, skiing in the Alps or encountering the big 5 in the Savana but I am afraid this bitesize update is quite dull. I suppose with all the drama we have had in the last 10 months (crikey – is that all? It feels much longer) I should be thankful for some peace and quiet. In my last update I shared my frustrations and honest emotions in the aftermath of a second craniotomy. Literally 8 hours after uploading that vlog I found myself back at hospital wearing another operating gown as I prepared myself for an appendectomy! The surgery went well (Goodbye appendix!) and I was home within 48 hours but unfortunately I picked up a post-op infection which led to another week spent in hospital. On account of the infection I didn’t eat for NINE days. For those who know me well, I am sure you can easily imagine how challenging this was for me. On the bright side I did lose a stone in weight – a goal I hope for at the start of every New Year but the means in which it was achieved is something I would never recommend. It took me another fortnight to get over the infection but I am delighted to say since then I have been exercising! Running, Bodyattack, weights and even a single session back on the hockey pitch. I have said it before and I will say it again – physical activity is the best medicine! Physically, mentally and emotionally I simply feel stronger. So with 5 new scars (2 from the craniotomies and 3 from the appendix) I am in a stage of limbo once again. I have had my 3-month follow up scans and the plan is to meet with my surgeon again in April. That meeting will dictate the next steps. It is looking likely that I might need more surgery and following that a combination of chemo and radiotherapy. At the moment it is largely outwith my control and I have made peace with that. There are a number of ramifications that the Funny Boy and I have had to deal with over the last few months. Those closest to us will know we were preparing to start the adoption process. Given my health we have made the difficult decision that this is something we can no longer pursue. 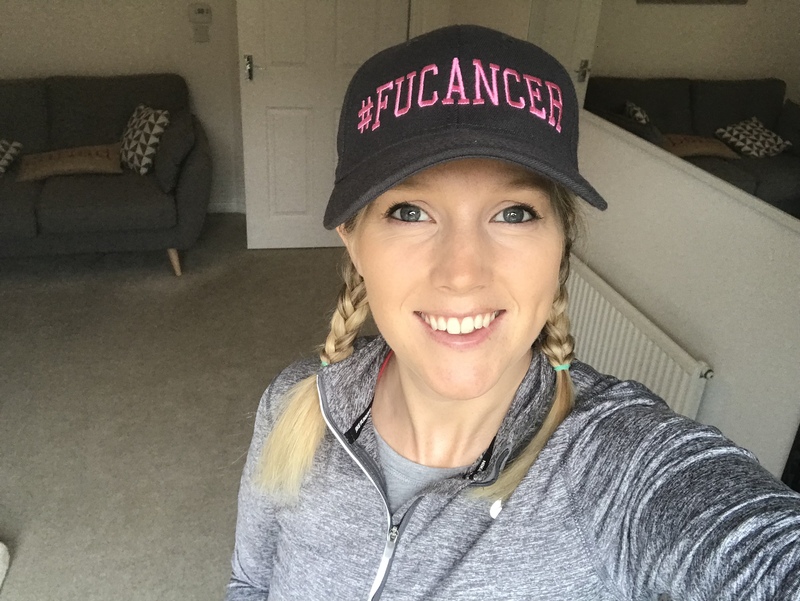 Cervical cancer treatment left me infertile which is something I have come to accept but this realisation feels like another devastating blow. Forgive me for sounding arrogant but I know the Funny Boy and I would have been awesome parents but c’est la vie – it was not to be! Anyway – back to the positives! I have been cleared to fly so I am looking forward to celebrating the marriage of my big bro and the lovely Katie in Canada! I am so excited to have two weeks away with my whole family! The Funny Boy and I have quite a few weddings this year which is great because it means plenty time to catch up with friends we don’t see often. We have also booked in a few extra special dates too. STICK IT TO CANCER is on track for the fourth year with the addition of two junior tournaments. Everything kicks off this Sunday for the Under 12s, June for the Under 14s and the adult tournament in July! Before I finish I just wanted to say how much we appreciate everyone who has been in touch. The Funny Boy and I have been overwhelmed with how generous and thoughtful our friends have been over the last year. Even Parsnip has been the recipent of handmade, personalised gifts. You have made a challenging time much easier. From the bottom of our hearts – THANK YOU! I am delighted to report that I am back home and reunited with my ever faithful sidekick Parsnip. After much deliberation by the medical team I have returned with my appendix. The risk of seizures coupled with the damage caused by pelvic radiation makes my case a complicated one. I am due to return to the General Surgery team in the new year to discuss an appendectomy in more detail but for now my next surgery is Craniotomy #2. In 2018 alone I have spent 20 nights in hospital, relied on 3 ambulance trips, benefitted from numerous appointments across a variety of specialities and been supported by a countless number of nurses. At this point, may I say I have NEVER met a harder working group of people than the NHS nurses; 12 hour shifts which include everything and anything from cleaning a range of body fluids, literally picking people off the floor, drying tears and so much more. I do not know how they do it but I remain in awe of their energy, empathy and ability to make the worst of times somehow better!! Today is STAND UP TO CANCER. The Funny Boy and I were due to attend the Live Show in London but due to my recent bout of illness we were forced to cancel. It is only when you are faced with a chronic condition you appreciate how frustrating and devastating it is to be constantly losing out on opportunities and experiences. From the everyday things like meeting a friend for coffee, singing in your car at the top of your lungs or playing your favourite sport with your team mates to the life changing events like starting a family or going for that promotion at work. These are the things that make life and when you miss those it is hard not to feel like you are missing out on life. Everyone faces challenges in their life but as long as you have your health you always have an opportunity to start again. This is the second time I feel my life has been put on hold as a result of badly behaving cells. In 2014 cancer stole my fertility; something I may never truly ‘get over’ but I am slowly coming to terms with. The struggle I am facing now is a loss of independence and an underlying fear of the unknown. It is hard and I would be lying to dress it up as anything else. Equally, I know things could always be worse. Never, ever take your health for granted. For as long as you have it you always have the chance to do more!